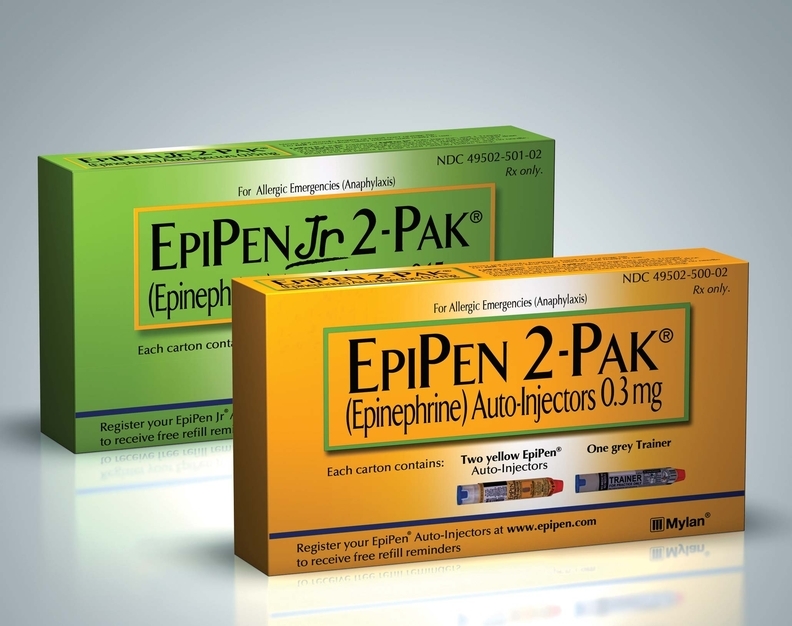 The U.S. Food and Drug Administration approved the first generic version of Mylan's EpiPen and EpiPen Jr., a move that the agency hopes will bring down the price of the automatic epinephrine injector that fueled a national debate on rising pharmaceutical prices. While other versions of the automatic epinephrine injectors including Impax Laboratories' Adrenaclick and Kaleo's Auvi-Q are on the market, Mylan's EpiPen maintains a dominant market share. Teva Pharmaceutical's product is the first direct generic copy of the EpiPen, which is widely used to thwart strong allergic reactions caused by bee stings and food allergies, among other events. Pharmacists can substitute Teva's version for Mylan's product at the pharmacy counter, unlike Adrenaclick and Auvi-Q. "Today's approval of the first generic version of the most-widely prescribed epinephrine auto-injector in the U.S. is part of our longstanding commitment to advance access to lower cost, safe and effective generic alternatives once patents and other exclusivities no longer prevent approval," FDA Commissioner Dr. Scott Gottlieb said in a statement. "This approval means patients living with severe allergies who require constant access to life-saving epinephrine should have a lower-cost option, as well as another approved product to help protect against potential drug shortages." Mylan has tried to stave off Teva's generic EpiPen copy since the abbreviated new drug application was introduced in 2008, arguing in a citizen petition that the generic version was too difficult to use. Between 2009 and 2016, Mylan raised the price of the life-saving device more than 500%. While the epinephrine used in the device only costs pennies per dose, the price for a two-pack shot up from around $100 to more than $600. Following the criticism, Mylan launched a generic version of the two-pack for $300. That sparked a congressional inquiry and multiple lawsuits, one of which alleged that Mylan overcharged the government by misclassifying the auto-injectors as a generic drug to avoid paying Medicaid rebates. That case was settled for $465 million last year. Mylan has been named in 15 class actions relating to the pricing or marketing of the EpiPen, according to Mylan's second-quarter earnings report. Another set of lawsuits claim that Mylan artificially inflated EpiPen's list price to provide kickbacks to pharmacy benefit managers. Some of those lawsuits were consolidated into a multidistrict case in a Kansas federal court. The drugmaker said the claims are without merit in its motion to dismiss the consolidated case, which is currently pending. A trial date is scheduled for July 2020. Teva's generic auto-injector follows the FDA's new guidance that aims to expedite the approval of drug and device combinations, which generally take longer to get to market. Teva shares increased about 7% Thursday while Mylan stock rose about half of a percent. Mylan's stock has precipitously dropped about 20% since January, in part because of the increasing level of generic competition.